She could ship just the insides with instructions on how to get it into a lightbulb if the customer wants to. I want a tiny ship to go in one. Or, a tiny spaceship! Sooo cool! A good amount of bubblewrap should allow her to ship them just fine, but I understand her hesitation with mailing - the packages are never handled as gently as you hope. 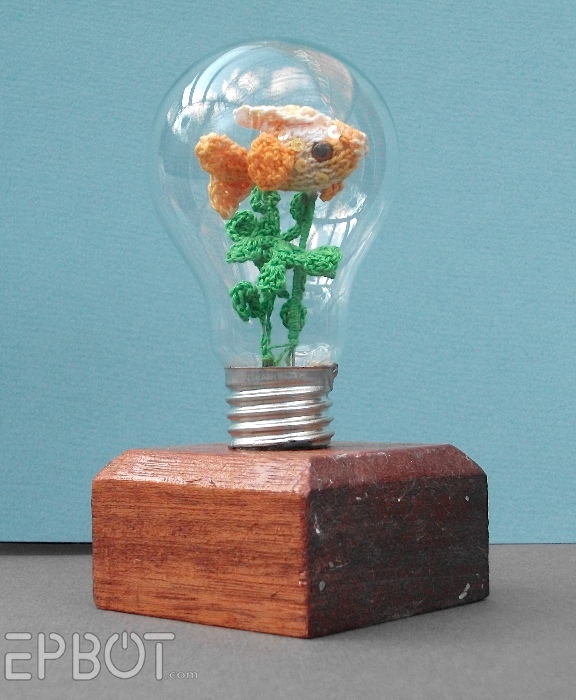 Thank you for featuring my little goldfish bulb! I WILL make more - just trying to find the time among various other commissions at the moment, so keep an eye on my Etsy shop for the future. Your turn now - what will you put in yours?! Oh wow! I love that so much! 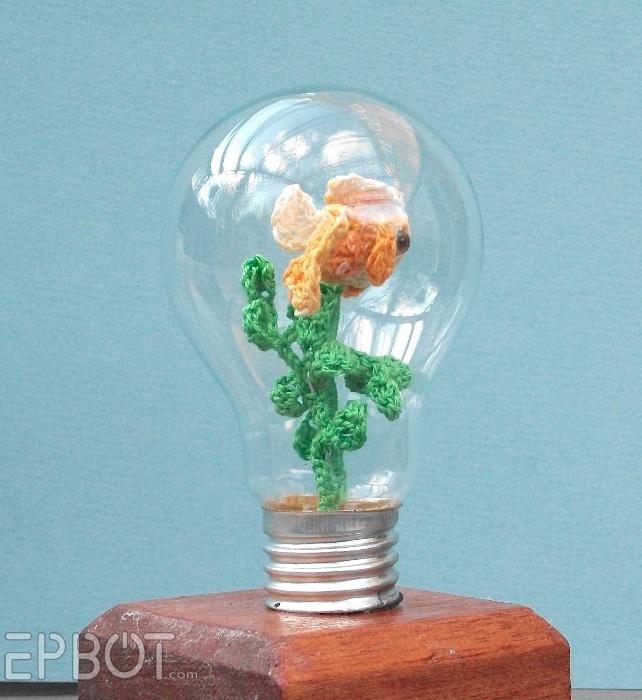 Jen, you need to sweet talk Caroline into knitting you a tiny seahorse for your own bulb! Can you imagine a whole display of them? A few different colors of knit fish in a few different sizes of bulb. It's a shame shipping them would be so hard, because I can't knit, yet think that that is absolutely PERFECT. something very undigified and involving girly squeels. I'd really like to try improvising this but we don't use incandescent bulbs at home; we use the curly energy-efficient ones instead. Dratted energy saving. That is fabulous. And, what about a piece of hard styrofoam, cut in half, with a section for the lightbulb hollowed out...that should keep it from breaking. I would think that if Caroline saved the packaging from the light bulbs, then repacked the bulb inside the packaging when she'd finished her creation, then wrapped the whole thing in bubble wrap and placed it securely in a small box, it would ship safely. We do similar things when shipping fragile items at my family's company; usually, the manufacturer's box is designed to cushion the object for shipping. Light bulb companies have to ship bulbs all the time, there has to be a way to do it which doesn't result in breakage! Holy cow this is soooo cute! This made my day! What a cool object! Also, Jen - way awesome that your jewelry stand was featured! That is incredible!!! I LOVE it so much! wow, awesome.